Although many of our original recommendations still remain, we have completely overhauled our article and chart on the best guitar stands, adding a few new models including the beautiful Zither Wooden Guitar Stand and the pro-grade Hydra Triple Guitar Stand from D&A Guitar Gear. Even the most dedicated guitarist won’t play their axe 24/7 – we all need to eat and sleep! When a guitar is not in use, more often than not you will want it either protected in a good case or resting on a good guitar stand. Because let’s face it – you don’t spend good money on a great guitar just to leave it resting dangerously against a wall! So, we’ve taken a look at the wide-ranging world of guitar stands and selected our favorite models that span different styles and price ranges. Then stick around for a guide to the variety of different stands and how to find the best one for you. Let’s dive straight in! A one-of-a-kind stand fit for any high-end axe. The sensible choice for the player with multiple guitars. A solid triple-guitar stand that won’t tip over. Hercules delivers a modern classic in the world of stands! The safest way to hang your guitar from the wall. An affordable no-nonsense tripod stand for one guitar. 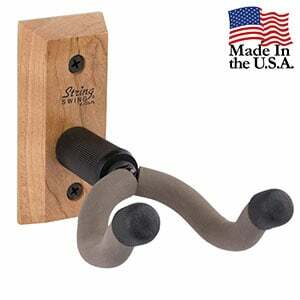 A well-made wall hook that keeps your guitar hanging. Basic and affordable, this is a smart choice for beginners. If you’ve spent a good chunk of cash on a beautiful guitar, chances are you want something equally beautiful on which to display it. This stunningly simple stand from Zither is well worth checking out if that’s the case. Each stand is hand-crafted from premium solid wood (choices include mahogany, walnut and maple) in Brenham, Texas, featuring a hand-rubbed oil finish. The padded yoke is pretty standard but functions well, while the base also features a padded strip. It’s not the cheapest stand out there, but boy is it good looking! Get used to seeing the name Hercules as the brand makes some excellent stands of all shapes and sizes. This popular rack is a testament to this, proving a smart solution for guitarists with several guitars. With special foam padding on all contact points, this stand keeps three guitars or basses safely stored, although the option for adding further yokes is available. It also folds away for easy storage and is lightweight at just over 3kg, although very stable when loaded. A great choice for both the home, studio and gigging guitarist. If a full guitar rack seems a bit too much for your home, but you still need to display more than one guitar, this high-end multi-stand from D&A Guitar Gear is an excellent alternative. It holds up to three guitars in a small space, using six legs to ensure great stability – even if you remove one or two guitars, the stand won’t tip over. Up top you’ll find gravity-activated locking heads, all with soft polymer coatings to protect the instrument’s finish. Stylish, practical and folds down to half its size for easy storage. 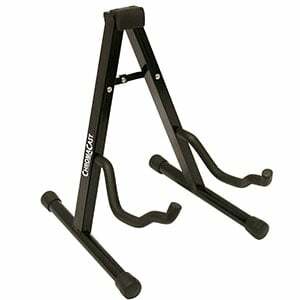 One of the reasons Hercules is a leader in guitar stands is due to its Auto Grip System (AGS). This technology ensures guitars are locked in place when the neck is placed onto the yoke. 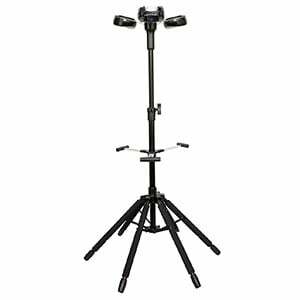 The GS415B stand features this AGS along with a tripod design, with two of the legs covered in a special foam to protect the guitar as it rests on the stand. This stable stand keeps the guitar upright and feeling secure. It’s not the cheapest tripod stand out there, but certainly one of the best. This strong wall stand proves a solid option for all guitarists for whom floor space is an issue. Although the basic design is shared with many wall hangers, Hercules’ distinctive Auto Grip System provides a very secure grip on the guitar neck when in place, ensuring there are no accidental slippages. With an all-round robust feel, the yoke is covered with a special foam to protect the neck while hanging. Other features of this model include a wooden Hercules-branded base and included installation components. 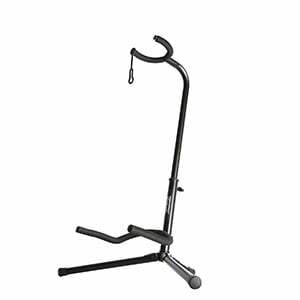 This is a modern classic in the world of guitar stands and a model many guitarists of all levels rely on. Of course, one of the main reasons is the very wallet-friendly price, but it sits in a tier above some of the more basic stands you may find in some beginner guitar packs. With a tripod design, features of the XCG4 include a black powder-coated metal construction, smooth rubber padding to support the instrument without damaging it, and an adjustable length making it suitable for both guitars and basses. 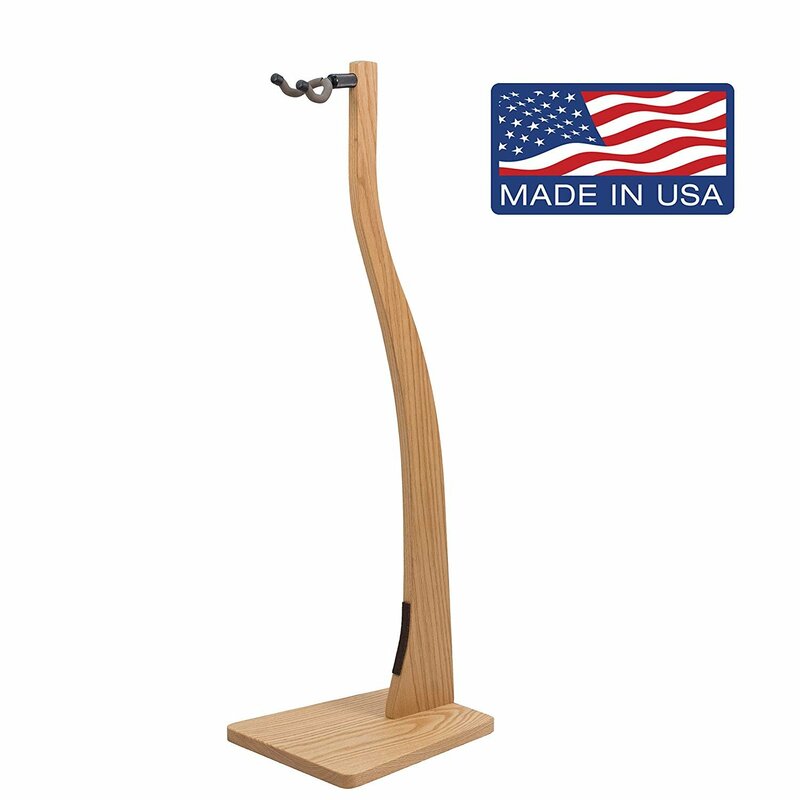 A cheaper option than the Hercules model above, this affordable American-made wall stand from String Swing is an excellent choice. 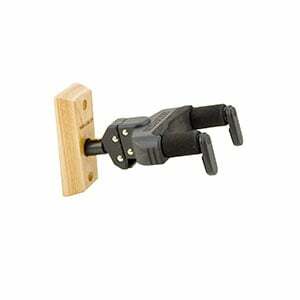 Suitable for all styles of electric and acoustic guitar, this stand fixes securely to the wall (with included screws and anchors) and features an adjustable yoke allowing you to find the angle that works best for your guitar. The arms are also padded to protect the neck and headstock. In addition to functioning well, it looks pretty good, with an attractive base made of genuine North American hardwood. The most basic stand in our chart, but still well-worthy of its inclusion. At around ten bucks the CC-MINIGS stand is a very affordable solution for many guitarists, especially those with multiple instruments who need to purchase more than one. With an A-frame and stepped yoke, it would suit both electric and acoustic guitars, as well as bass guitars, offering soft foam arms to protect the instrument. 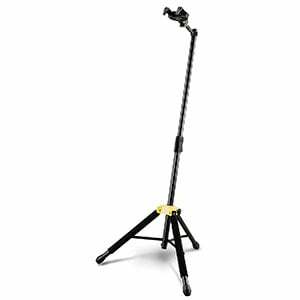 This lightweight stand also has the advantage of being very portable and easy to store when not in use. A very solid choice for such little cash. While guitar stands come in all shapes and sizes, we can split them into roughly four different categories, all with their own advantages and disadvantages. Let’s take a quick look at them. The A-Frame is the type of stand most guitarists will start with because it is the simplest and often the cheapest of the floor stands. These stands – which fold out into an A shape (hence the name) – look deceptively small and unstable, but they actually hold guitars very well. Due to the small size and foldability, they are also great for travel and storage when not in use. Of course, they come with their negatives. Accidentally knock a guitar sitting on an A-Frame and chances are it will fall over – not great if you have children, pets or clumsy people nearby. They often do not hold the guitar upright – usually at an angle – meaning a bit of room between the stand and a wall is often required. But, for a cheap and simple solution, A-Frame stands work well. There are no prizes for guessing why these are called tripod stands – they have three legs (although, depending on the model, they can sometimes come with more). These fall into the same tier as an A-Frame in terms of being popular with beginners because they are simple to use and cheap to purchase. They tend to offer better stability than an A-Frame as they support the neck of the guitar as well as the base. Their negative points centre around the fact that they are quite bulky and require more floor space to hold the guitar in, while they aren’t as portable as other stands due to their size (even if some do fold down a little). If you want your home to resemble a guitar store (and yes – a lot of us do! ), then a wall-mounted stand may be a good route to explore. As the name suggests, these stands securely fix to a wall, allowing the guitar to hang freely by the neck. The advantages of these affordable stands are multiple. In addition to a cool way to fill wall space and display your axe collection, they are very useful if floor space is at a premium. If you have children or pets moving around the house, having your precious guitar elevated out of harm’s way is also a sensible move. The disadvantages of these stands are that they take longer to set up and more effort – with a drill, screwdriver, plugs and screws needed (although many will provide screws and anchors). Also, unless you have strong walls, you run the risk of the guitar stand falling off. While beginners will make do with an A-Frame, Tripod or Wall-Mounted stands, more experienced guitarists may consider a stand that can cater for more of their collection. The majority of these multi-stands will use a tripod design and house at least three guitars. Many are designed to be anti-tipping, so removing one guitar won’t result in a catastrophe as the rack becomes unbalanced! You can also find guitar racks, which are what you will find in studios and on stages around the world. These can home many guitars, placed into the stand on their sides. 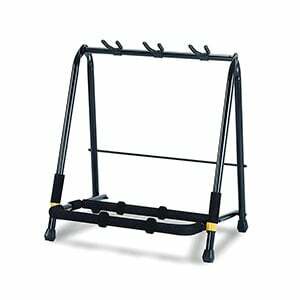 These racks are great for gigs as most models will conveniently fold up for easy transportation. The disadvantages of multi-guitar stands and racks is that they are usually more expensive. They also take up a considerable amount of room, regardless of how many guitars are being stored at one time. Plus, if you accidentally knock the stand or remove/replace a guitar too quickly, you risk the guitars on the stand bumping into each other. The good news is that the majority of guitar stands – at least the models we have highlighted – will cater for electric and acoustic guitars, as well as bass guitars and other instruments such as banjos. Ukuleles are tricky as they are so small, but both tenor and baritone ukes will be suitable for many guitar stands. Smaller ukuleles may be a bit too small, although you can find dedicated ukulele stands. Whether you have one or ten guitars, it is advisable to have a stand for each of them – or at least the guitars you use regularly. If you use an electric guitar and a bass every day, then buy two stands. If you use two electrics and an acoustic daily, then have three guitar stands (or a rack). Otherwise you have to store them in guitar cases, which cost the same and take up just as much room. Or you can leave them propped up against the wall and take the risk of them falling over (Note: Please don’t do that!). Also, be sure to pick something stable and something that includes padding or a soft finish on all points of contact with the guitar. Resting a beautifully-finished guitar against a hard metal surface is a recipe for disaster. Portability is also a big factor. Perhaps not for beginner or casual bedroom players, but if you regularly practice with a band or gig, then transporting a stand/rack is another consideration. When you have to transport guitars, amps, pedals, cables and other things, a portable stand keeps the hassle lower. Ultimately, go for the best stand your budget allows. Of course, it is probably overkill buying a $200 rack if you only have one guitar in your collection, but a good stand is something that you will usually keep hold of for decades – many times lasting longer than your guitar. Buying quality will usually avoid buying twice. There we have it! Buying a stand is certainly not as complicated as buying a guitar or an amp, but it’s worth some consideration. We hope our chart has offered a little inspiration and our guide to the different styles will help you settle on something that works for you. Good luck!